Today was a new day. The green twisty winding contouring flat Tonto Trail kept on going and the miles came easy. I was in the sun almost instantly too, with no real shade after 6:15am. The joys of hiking on the sunny south side. Early morning sun on Grapevine Canyon. 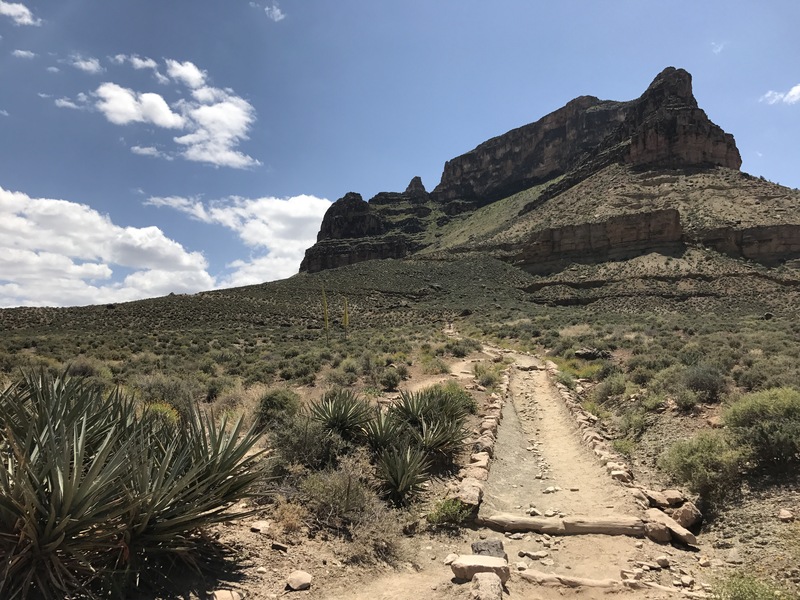 I made the 13 miles to the intersection with the South Kaibab Trail well before noon and took a lunch hiding in the shade under the outhouse porch. Even the century plants on the Tonto get twisted up. My current permit has me continuing along the Tonto Trail for another 40 miles west after resupplying on the South Rim, but I think I’ve had my fill of this section of the canyon. I long to explore more of the river and see the Bright Angel. Spend more time in the Kaibab meadows. We’ll see if I can make that happen. 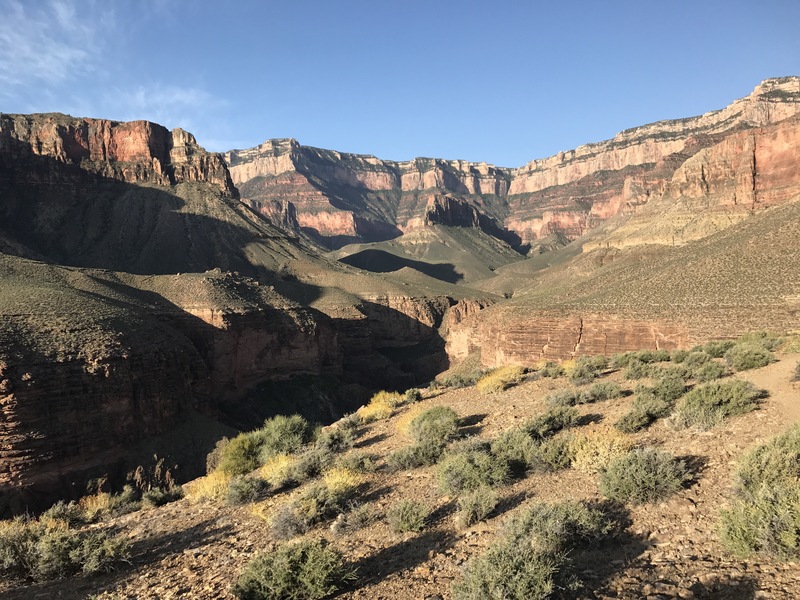 The South Kaibab Trail is one of the two main trails down to the River from the Rim, and the only one that uses ridgelines that whole way which gives it expansive views. 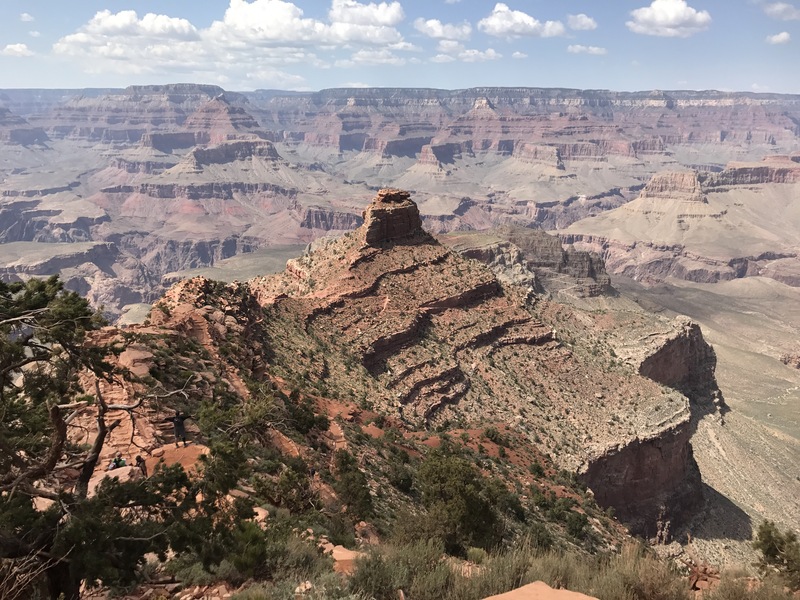 It was built by the Park Service in the 1920s because of some of the early canyon pioneers who were charging tolls to go down the Bright Angel Trail. The Park Service wanted a trail free for everyone. From the Plateau it was 4.5 miles and a little over 3,000 feet up. Not too shabby at all. And what awesome trail. Wide enough for two to pass easily, even on the switchbacks and not a loose rock in sight. Switchbacks all the way down. The river was barely visible now buried in its deep gorge as I climbed higher through the changing rock formations. At Cedar Mesa I sat and chatted with an NPS volunteer for a bit before taking on the last bit of the hike up. Somewhere along the hike up from Cedar Mesa. And finally I was at the rim! In the masses of people. Looking at my clock I knew the post office closed at 3:30, so rather than hike into town I immediately hoped on the free shuttle to try to get over to it. Alas, I was 15 minutes late. 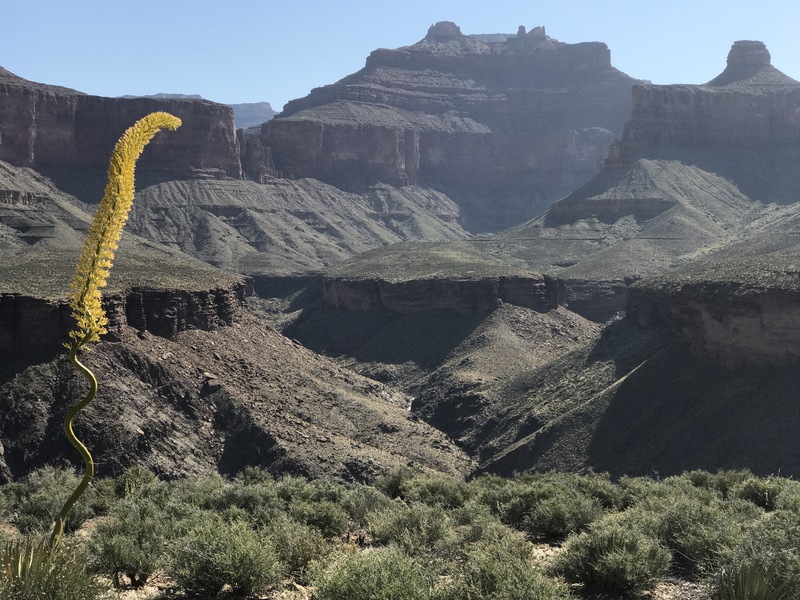 I popped over to the campground where I joined the backpacker campsite and met off route American Discovery Trail hiker Styles and Bounce and Bonk who are finishing their AZT hike with a rim to rim trip in the next two days and skipping the Kaibab Plateau. The rest of the afternoon is kinda a blur of regular town stuff. Laundry and calls and food and grocery stores and campfires. It’s supposed to rain and possibly thunderstorm tomorrow so I couldn’t have picked a better day to plan to take “off”. 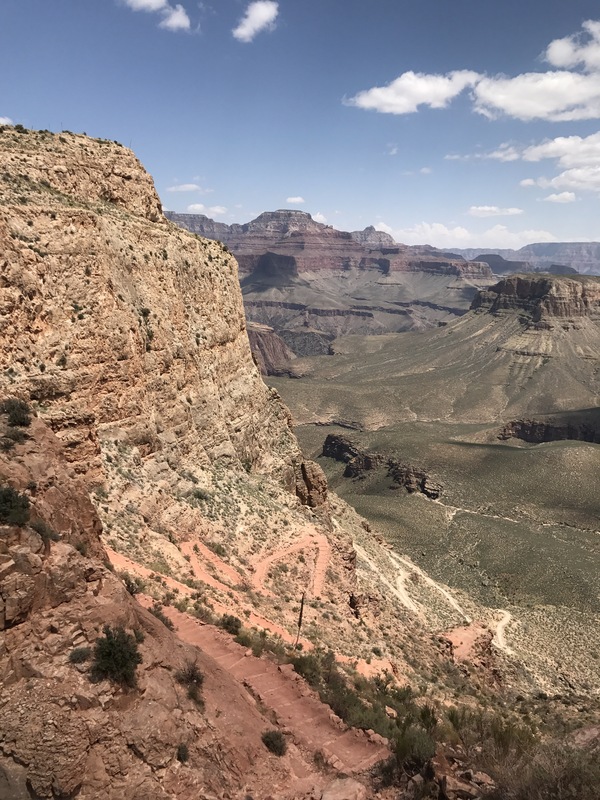 It won’t technically be a zero as I’ll wander the rim trail from the South Kaibab to Bright Angel Trailheads to connect the steps. Tent is up for rain and cold tonight. The first time we hiked the S. Kaibab we were with Little Bug (PCT 2011). She was on the GRCA trail crew and her job included maintaining the outhouses. We hung out with her and learned how important those duties are. It also meant we were at Tipoff in the full sun of a hot day. So we too took a break under the outhouse porch. 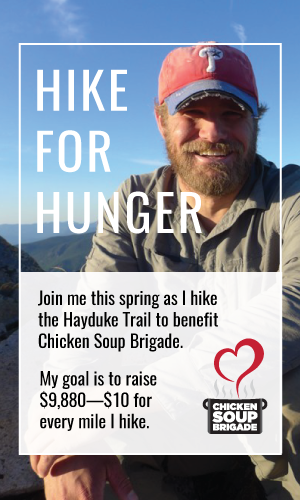 It was cool because we got a couple prim and proper day hikers to embrace and appreciate the strategy too!